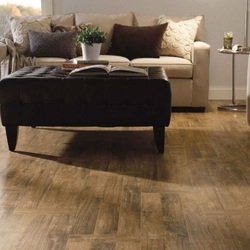 we believe that laminate floors are not merely a substitution to hardwood but a viable choice to place in your home. That's why we lead the industry in developing cutting-edge technologies that allow us to create realistic, stunning designs that are highly-durable, easy to install and complimentary to your lifestyle and home. So, no matter what your design style, what your personality, where you live or who you are, Fausfloor® is the perfect choice. With innovative technologies such as Embossed In Register®, MicroBevel®, Interplank®, Multi-Direction Design™, and DualFinish™ our laminate products resemble the true nature of ceramic, wood and stone. Whether it is the unique grain of an exotic wood or an intricate pattern found in tumbled stone, our textures capture even the most subtle variations creating authenticity you can see and feel. By nature laminate floors offer do-it-yourselfers and professionals the ability to install a new floor without the need of glue or nails. Add to that our one of the kind Wide Plank System and pre-attached underlayment* and you have a floor that allows for a faster, more stable installation with fewer joints. Fausfloor® laminate floors are certified by the North American Laminate Floor Association for our overall quality, durability, strength and performance as well as the GREENGUARD Environmental Institute for GREENGUARD standard for Low Emitting Products. Rest assured when you choose Fausfloor®, you are choosing the finest high-end laminate floor available in today's marketplace.